MAKE IT FROM SCRATCH! At the 20th Annual Organic Growers School Spring Conference, Meredith McKissick taught a class called “Things You Should Be Making from Scratch” . The class filled up before the conference, so I could not attend…but Meredith gave me some vinegar mother [read super-thrilling! ], and the class handout. Pour the wine into the jar and float the vinegar mother on top. Cover the jar with a couple of washcloths and secure with a rubber band. Allow to sit at room temperature (or a little cooler, like a basement) for one month. The longer it sits, the stronger the flavor. Very do-able, right? It was super easy; starting the red wine vinegar took less than 5 minutes. Now all I have to do is wait a month while the vinegar mother does her job. Thank you Meredith! Among other things…Meredith McKissick is the Executive Director of the Organic Growers School, the owner of Sweet Earth Flower Farm, co-owner of Crooked Creek Farm/ Foothills Family Farm, mother of two young sons, and a great cook who does a LOT of cooking from scratch. and herbs from my own garden, and concocted a dip to go along with the oven fries. The fries were a bit spicy for my friend M, but her husband loved them. I probably shouldn’t have added the last few shakes of cayenne pepper! I don’t usually follow recipes for this sort of thing…so I will give you the general idea and you can change it up to suit your own tastes. Potatoes – enough to fill a large cookie sheet. Mine were harvested from my garden, a mix of Yukon Golds, French Fingerlings,, and Kennebecs. Preheat oven to 450 degrees. Cut up potatoes into French fry shapes and put in large bowl, leaving skins on. Chop onion and add to bowl. Chop and add rosemary. Crush dried basil and add to bowl, removing stems. Add a generous amount of olive oil. Add salt, pepper, and cayenne pepper to taste. Toss everything well. Spread evenly on a lightly greased cookie sheet, ideally in a mostly single layer. Sprinkle with paprika. I added a bit more salt at this point also, and that (too spicy for M) last bit of cayenne. Bake until done. I like to cook them until they are browning on the edges. Try it with sweet potatoes too! My daughter (as a 6-year-old) and I loved the white dip served with the fried eggplant appetizer at Barracas restaurant in New Orleans, and I have always wanted to try making it. The waiter gave me an idea of what was in the dip. On Superbowl Sunday I was missing one critical ingredient…horseradish…and I didn’t want to go to the store, so this recipe has no horseradish. That may have been good since the fries were spicy, but the horseradish adds a really nice snap. I didn’t measure anything, so these measurements are pure guesses. I just tasted and adjusted accordingly. Mix everything up. Taste and adjust. Serve dip with oven fries. Enjoy. This spring we are reveling in eating sweet strawberries from the Tailgate Markets. We’ve made three batches of strawberry shortcake so far, along with a strawberry tart. 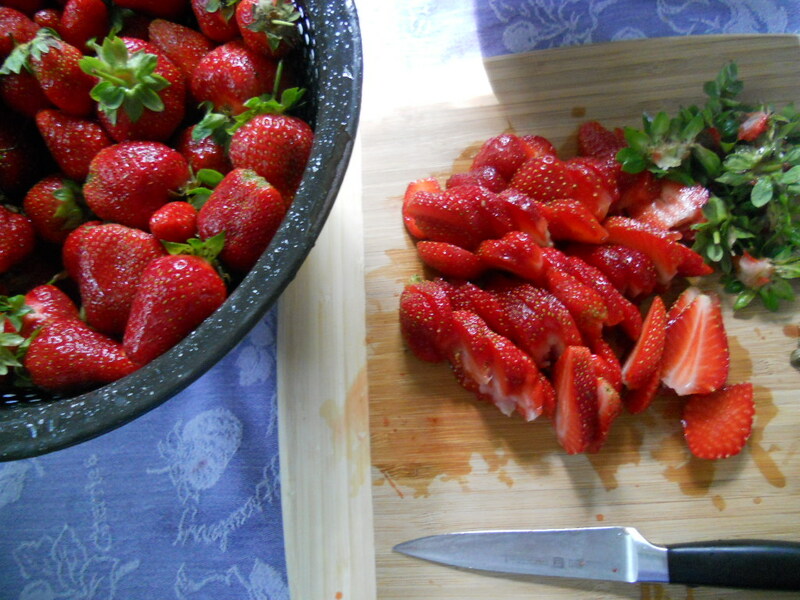 What a wonderful way to celebrate strawberry season. 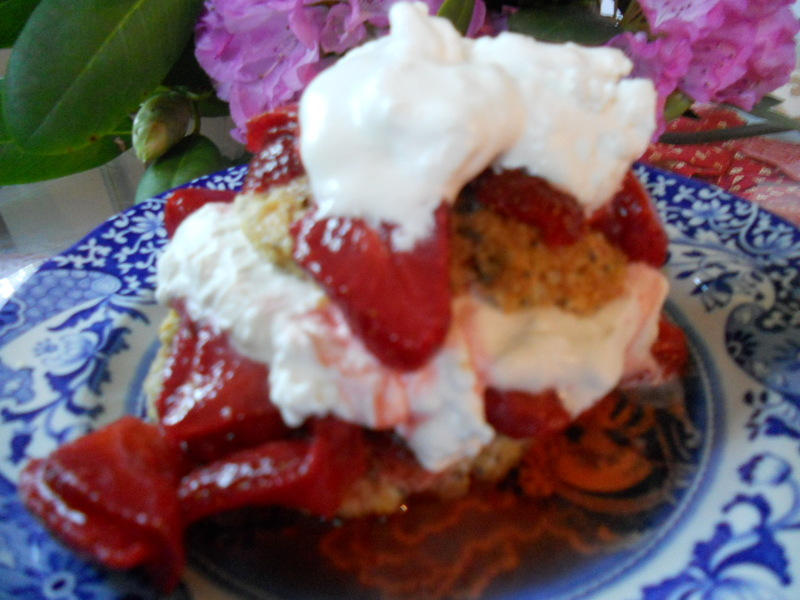 Strawberry shortcake is easy to make. Basically you just make sweet biscuits, then cut them in half, and layer them with strawberries and whipped cream. In a large bowl, combine all the dry ingredients. Mix well. Gently grate the butter and evenly fold the grated butter into the dry mixture, trying to keep the butter pieces from sticking to each other. Put bowl in freezer for a few minutes. 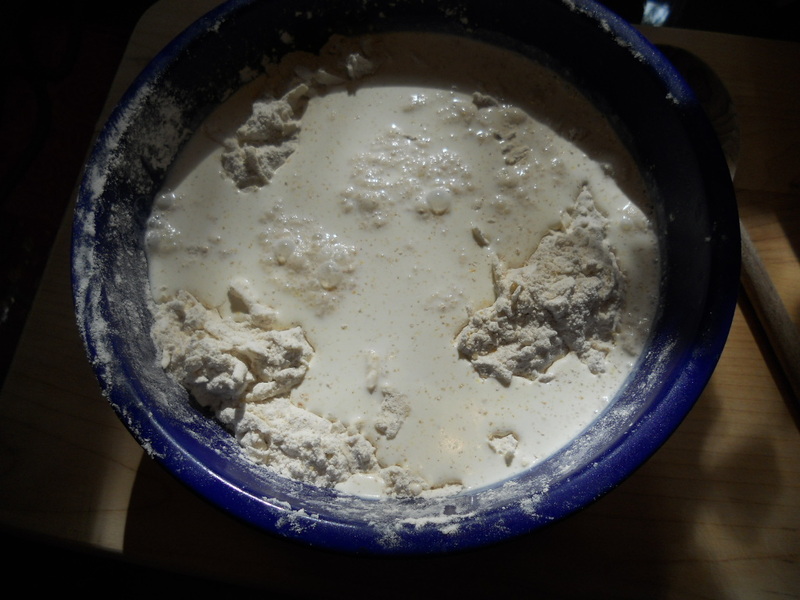 Remove bowl from freezer, and gently stir the half-and-half into the dough until it is sticking together well and will form a somewhat sticky ball (that you are able to handle). The dough should not be too super-sticky or too stiff. Put the dough on a lightly floured surface and knead gently for about ½ minute. Pat the dough into a rectangular shape about ¾ inch thick. Cut out individual shortcakes with a biscuit cutter about the size of a soup can. 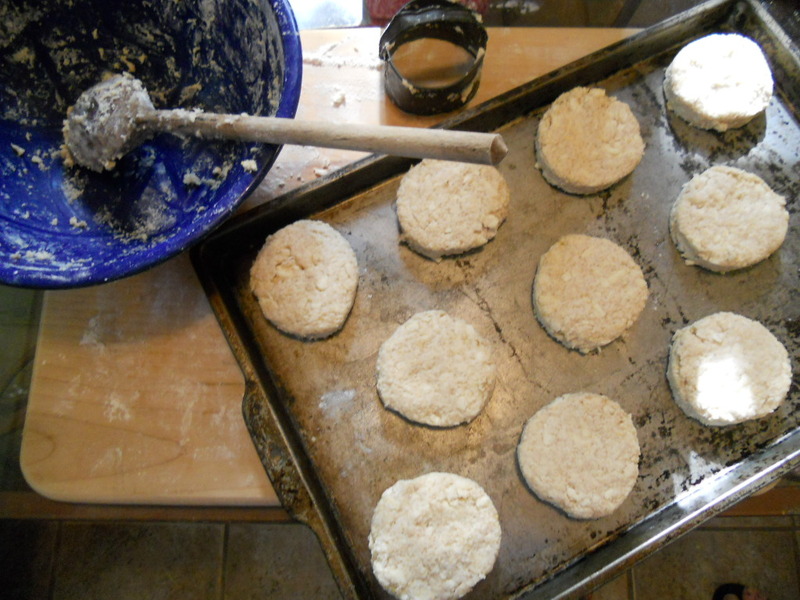 Combine remaining dough, re-pat out the dough to ¾ inch thick, and cut out the remaining shortcakes…until you have used up all the dough. Arrange on a baking sheet around an inch apart. Brush shortcakes with cream or half-and-half and sprinkle with sugar. Bake until nicely brown on top, about 14 minutes. 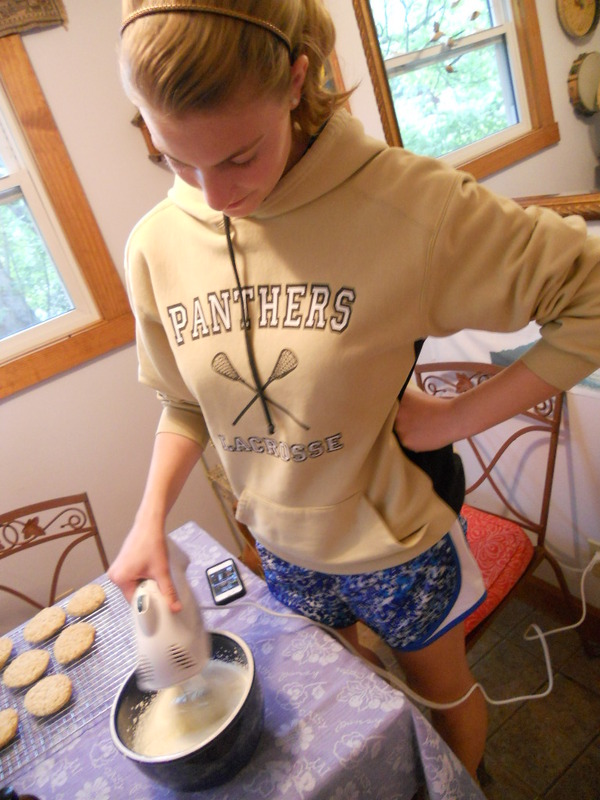 *You can also use 2 cups of unbleached all purpose flour, and eliminate the whole wheat pastry flour and the cornmeal. Pull the caps from strawberries and slice about 1/8 inch thick. Add sugar to taste. Add a splash of orange or lemon juice. Toss to combine, taste and add more sugar if needed. 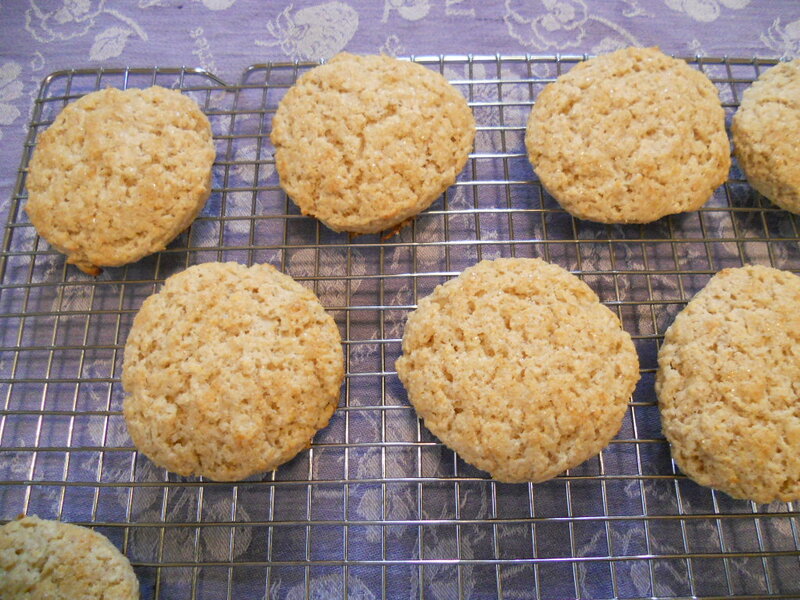 Cover and refrigerate until assembling the shortcakes. In a cold, steep-sided bowl, whip cream until it forms stiff peaks. Be careful not to over-whip the cream and “make butter”. Once stiff peaks are forming, gently fold in one teaspoon of vanilla. With a bread knife, cut each shortcake in half. Ladle strawberries on to the bottom half of the shortcake, and add a generous dollop of whipped cream. Top that with the upper half of the shortcake. Ladle more strawberries on to the top shortcake, and add another generous dollop of whipped cream. Garnish the very top with a strawberry if you like. Using these amounts of strawberries and whipped cream, you will have two or three extra (plain) shortcakes. Mardi Gras Day is this Tuesday, February 21. Ashevillians can parade today (Sunday) at 2 p.m. ~ starts on Wall Street and wraps around down Haywood Street and back around by the Grove Arcade. For those who don’t already know – Mardi means Tuesday, and Gras means Fat – which is why it is also called Fat Tuesday. Fat Tuesday indicates the last day of feasting before you must start fasting during Lent (a period of fasting with the purpose of cleansing yourself, physically and spiritually, to prepare for the celebration of Easter). If you can’t make it to New Orleans or some other town that celebrates Carnival, you can at least cook up a pot of gumbo. Today’s weather is perfect for blasting some Mardi Gras classics while getting down with some roux on the stove. Since the basis of good gumbo is a good roux, allot at least a half hour to 45 minutes for getting your roux right before proceeding on to the next steps. In other words…relax into it and don’t hurry it. If you make gumbo today, it will be better tomorrow and even better on Mardi Gras Day. 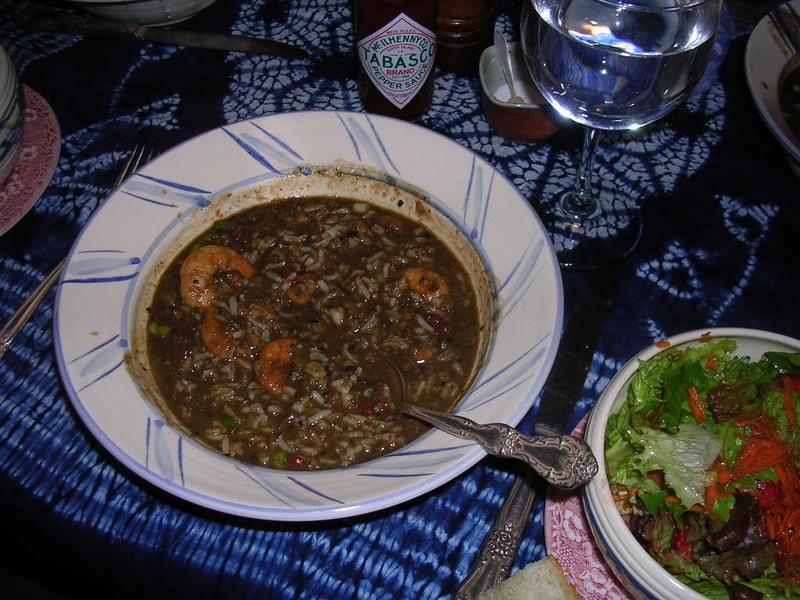 Keep in mind that gumbo is a personal thing – meant to be elaborated on by the cook (that’s you!). Can’t go wrong with lots of onion, green peppers, and celery sautéed into that roux. And remember to wait to throw the more delicate seafood in at the last minute, so it doesn’t get tough. Serve with LOTS of good French bread and butter. And of course (no-brainer), serve gumbo over rice. Gumbo HAS to have rice, or it’s not gumbo. Note: I would eliminate #11. Why would you want to cool down your gumbo? And why would you want to be messing around with a big heavy pot of hot gumbo in the sink? That sounds like an accident waiting to happen.